MG has used the Shanghai Motor Show to preview the exciting new MG3 supermini, in advance of the UK and European launches later this year. Carrying forward the styling cues first illustrated on the MG ZERO concept vehicle, the new European MG3 is a distinctive statement of modern British style designed to target young and style conscious buyers, wanting something that’s fun to drive and own. This unique and contemporary style was brought to the supermini segment by the design and engineering team at the MG Birmingham site in Longbridge, UK. The MG3 will become the second in a new generation of MG vehicles to leave the assembly line at the Birmingham factory. At launch, customers will be able to personalise both the exterior and interior of this new supermini MG making it fun to buy and own, as well as the MG trademark of being fun to drive. MG’s UK based design team have given the new MG3 a cheeky touch of flair from every viewing angle. How do I look from the front? 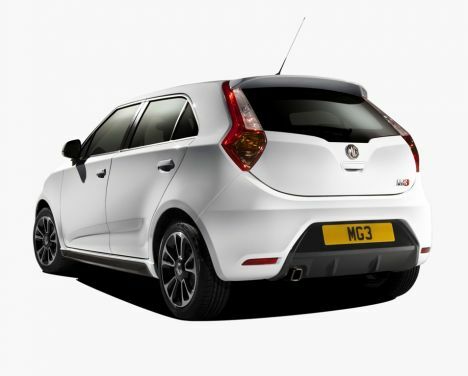 - With a flash of style from the ‘hockey stick’ LED daytime running lights on every trim level, a full width black mesh grille, and black A-Pillar and ‘visor’ wraparound style windscreen, the MG3 is unmistakable on the road.